The TV tower on Iriški Venac is one of the prime symbols of both Mt Fruška Gora and of Novi Sad. During the 1999 NATO bombing campaign the tower was hit with several rockets. There have been no serious calls or attempts to renovate it, neither there were any in favor of tearing it down. Built as symbol of modernity, of the new era of communication and of the ability of a socialist country to provide its citizens with all the modern amenities, the TV tower on Iriški Venac soon became one of the prime symbols of both Mt Fruška Gora and Novi Sad, not least because it stood close to the tallest peak of the mountain and can thus be seen from far and wide. 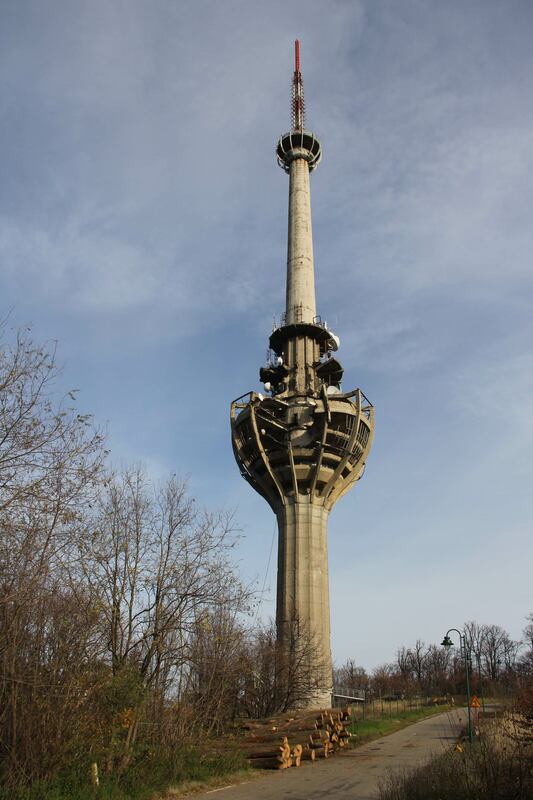 It is important to note that the Iriški Venac TV tower also included Novi Sad–the capital of the autonomous province of Vojvodina–amongst just a few cities in the whole of Yugoslavia that had such a technological and architectural marvel. During the 1999 NATO bombing campaign the tower was hit by several rockets. Though severely damaged and rendered useless, it stood tall. Soon after the end of the bombing the tower was partially repaired and has since been used to hold several TV antennas. The old, small hotel (owned by the state) standing next to the tower was renovated in 2003, bringing in new guests who marvelled at its half ruined appearance. 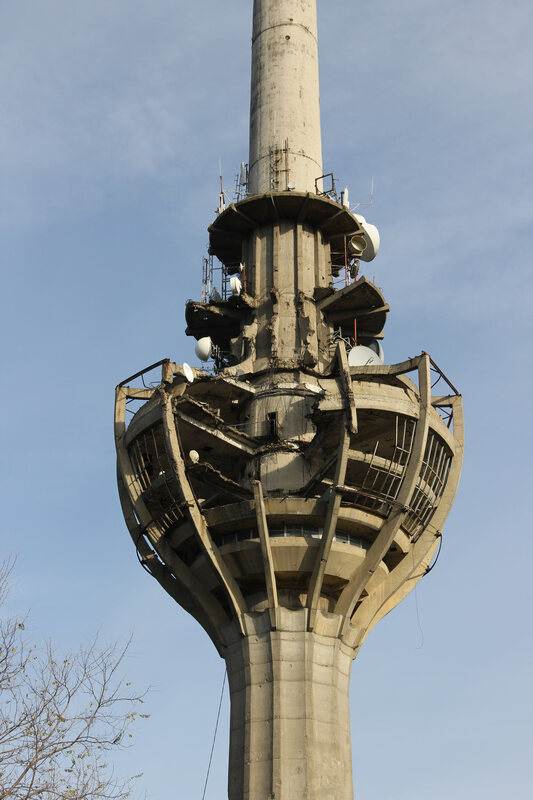 After 1999 the scarred TV tower also became a monument to the NATO bombing and many locals and visitors alike see that aspect of its existence as its main purpose today. There have been neither serious calls (or attempts) to renovate it, nor have there been any in favour of tearing it down. Damaged, but standing, the tower still serves part of its original purpose hosting several antennas. The tower on Iriški Venac is not listed as a heritage site. VD: Do you see that TV tower as one of the symbols of Fruška Gora? VD: And what do you think, now that it’s damaged, you surely remember what it was like before the bombing, do you think that it’s a bigger attraction now or before? MD: Well, I think it’s now a bigger attraction. Just as a memory of how it was, how this, how that… There weren’t so many people before as now. VD: And do you think that it is better to leave it like this, like a memento? MD: I don’t think so, no. VD: So it should be repaired? MD: Yes. It would be better. What does this represent? It represents our weakness. I don’t know… It represents the wrongdoers. VD: Well, yes, but it’s a kind of monument to those wrongdoers, to wrongs committed? MD: It would be better not to remember that any more. MD: Do I show them round? VD: No, is there anyone who comes and says, “I have to see exactly that”? Is it interesting to anyone? MD: Well my friend came from Norway about five-six years ago. His first time here. He heard about it, read about it, the TV tower, Fruška Gora, Brankovac, I don’t know, the Šatrinci lake and I don’t know so I drove him up. He was interested actually in the history of it because he has roots from Serbia. VD: and tell me, what do you think about the monument here on Iriški venac, just a hundred metres away, what do you think about it, which of those two was the more interesting for him? MD: This one is more interesting for everyone, the TV tower. VD: As an unplanned monument? MD: Yes, as a big structure, which is, what… We were just talking about when it was built, when, what was… I don’t know, was it the 70s. MD: When there was money! VD: Yes. And tell me, you’ve actually been inside a few times, right? Was it your uncle who worked there? MD: I played table tennis here in the middle. I’ve been all the way to the top, 162 metres. VD: Well that’s why you’re sadest? MD: I remember it all, all this is new, this was all destroyed, bombed out. There was some life. Now it is, as they say, more interesting as some kind of history, it’s talked about… So I think it would be better to repair it. VD: Yes, because they say that even if they repaired it they would leave this bomb in front to be talked about. MD: Well, yes, for there to be some memory. VD: And tell me, they say it can be seen from the motorway. Is it visible from Bukovac? MD: Of course it is. You can see all of it. Literally two kilometres before Bukovac the whole tower can be seen. I’m telling you, I have a summer house in Fruška Gora, behind Bukovac, 45 minutes on foot or 15 by motorbike. VD: You know what this looked like before ’99? VD: Did you see it as a kind of monument, as something of value, something tourists would visit…? VD: We could say it was a kind of landmark. TM: Like the Avala Tower. VD: To all intents and purposes we could say it was one of the symbols of Fruška Gora? TM: A symbol of Fruška Gora definitely and also Novi Sad. VD: And tell me, for TV Vojvodina it was one of the most recognisable symbols? TM: Well it was their main broadcasting centre until the bombing and then digitalisation. Digitalisation made much of the tower’s equipment obsolete and that was moved to other premises but it remains as a kind of communications centre. VD: It was also a valuable architectural monument before it was damaged. What do you think about it now? Is it interesting to people today with all this damage…? VD: How many bombs hit it? TM: 56. I mean they didn’t all hit the same spot but there you go, it survived. It’s a heroic tower, as they say. VD: It really is. And do you think that people come here now to see it because of all that… I mean, do you think it now has more visitors who come to admire it and take pictures? TM: No… I mean, they do come, they take pictures, it is interesting because it was bombed and damaged, they are interested in this bomb here, that’s more like… Like people like to take pictures in Belgrade, in Belgrade there are also lots of things that were damaged. VD: And was this bomb left there on purpose as a kind of memento or…? TM: Well we left that there as a reminder of what they did and we’re planning to put up a plaque so people know. VD: Tell me, the TV tower, when your guests arrive at the hotel, do you think they find it interesting? How do they see it? Do they take pictures? ZT: Well yes, they do find it interesting because it’s unusual. Within… except for the one on Avala there’s no other tower. VD: And do people know, especially foreigners, do they know what it is? 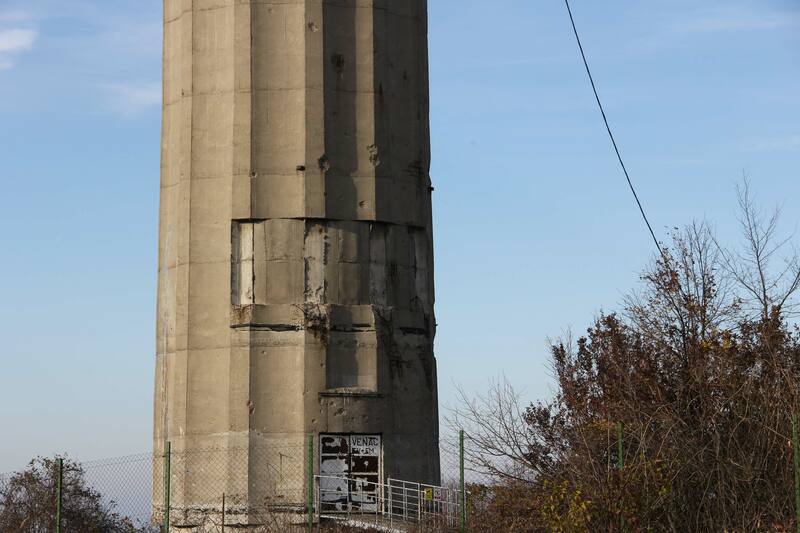 ZT: Well we tell them that NATO destroyed it, tried to destroy it but didn’t succeed and that it was damaged but that it’s still in use – not as a TV tower but I think the army still uses it. I don’t know how but that’s what we heard… They use something and it still works. VD: Do you personally think that it’s become a more important monument, damaged like this, than it was before? Before it was just a TV tower but now it’s become a TV tower and a monument to the events of ’99. Do you think something’s changed? ZT: You could go in and see the view, it’s a good viewpoint. Now it’s quite damaged and hazardous. VD: Yes, I saw that there were some workmen there. Do they come from time to time? ZT: They’re there all the time. Keeping an eye on things. But mainly people take pictures. It’s a monument to the NATO bombing. ZT: They’re both here and serve the same purpose! VD: And what do you think, should it be repaired? ZT: Well, personally I think so. VD: You think that would be a better option? ZT: Yes, to make something up there, a viewing platform, maybe a launchpad for paragliders. It’s hardly used. Just a bit. All of that can be done from the ground now. Maybe a restaurant, a café, a viewing platform with binoculars. Something like the Avala Tower. You can see all of Vojvodina and even a bit of Croatia from there. On a clear day you can see the tower in Vukovar, the water tower that was destroyed in the last war. VD: Tell me, do you think that it’s a symbol of Fruška Gora today? I mean, was it before? ZT: Definitely. Even from the town, from Novi Sad, and the surrounding towns like Mitrovica and Ruma and even Belgrade, it’s something to find your bearings. You know exactly what’s underneath it. You know there’s a hotel and over there the monasteries, to the left and right. Exactly like… You can see it from all sides. ZT: They are there constantly, on duty, watching. But mostly people are shooting, they are painting. That it was a memory of NATO bombing. ZT: Both of them are there and their purpose is! VD: How do you feel you need to restore it? ZT: Well, I personally think so. VD: Do you think it would be a better variant? ZT: Yes, to make some content up, a lookout, perhaps a paraglider. He's almost unused, for a little bit. Sadly everything can be done from the earth. Maybe a restaurant, a cafe, a gazebo with binoculars. Something like the Aval Tower. It covers the whole of Vojvodina, so part of Croatia can be seen from there. There is also a nice time in that tower in Vukovar, a watercourse one that was bombed in the last war. VD: Tell me, do you think this is simply one of the symbols of Fruška Gora today? I mean, it was earlier. ZT: Sure. He is even from the city, Novi Sad, and the surroundings of other cities and Mitrovica and Ruma, so here we say of Belgrade, comes as some kind of orientation. We know exactly where it is. We know it's here under the hotel, that the monastirs are from here left and right. It's just like... See from all sides.